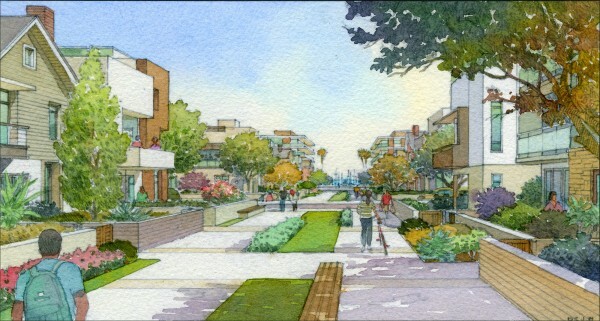 A potential walk street through Harbor Village, the AES mixed use proposal that voters rejected Tuesday night. Voters in Redondo Beach appear to have rejected a change in zoning to remove industrial uses from their city’s waterfront after Measure B narrowly lost Tuesday night. The measure, which proposed to replace the AES power plant with a mixed use development that included 600 residential units and a boutique hotel, was opposed by 51.9 percent of the votes thus far counted — 5,614 voters were against Measure B while 5,213 voted for it. Some uncertainty remains in the 1,500 provisional ballots that remain to be tallied, but with a margin of 401 votes to overcome, Measure B is all but certain to be defeated. The final tally will be announced Monday. Turnout was 24.6 percent of the 44,417 registered voters in Redondo Beach, according to City Clerk Eleanor Manzano. The measure’s defeat came as a surprise to even its opponents. AES, a multinational corporation which is one of the world’s largest power producers, sold Measure B as “the only guarantee of an industrial free waterfront.” The corporation, which drafted the ballot measure and was supported by a majority of the City Council and the Redondo Beach Chamber of Commerce, by last filing period had outspent opponents $857,000 to $8,700. 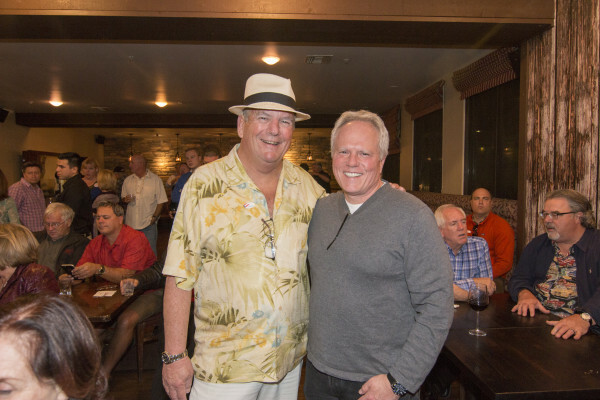 Brand and his longtime political ally, citizens’ group Building a Better Redondo president Jim Light, waged a campaign that focused largely on alleged traffic impacts of AES’s proposed “Harbor Village” plan. According to Light’s calculations, the plan would have created 11,269 new weekday car trips and 12,391 weekend trips. The campaign was aided by R4, a newly established citizens group that led canvassing and phone bank efforts. The Harbor Village plan called for a change from industrial zoning to mixed use and commercial zoning, allowing allowing 600 residential units, 85,000 square feet of commercial development, and 250 hotel rooms. The zoning also required that 20 percent of the 50 acre site, or 10 acres, be open space. But Redondo voters, many who have endured a history of questionable waterfront development that has earned their city the derisive nickname “ReCondo Beach,” balked at the new development. The man most responsible for crafting the plan that became Measure B, AES Southland president Eric Pendergraft, watched election results unfold Tuesday night with a growing sense of disbelief. 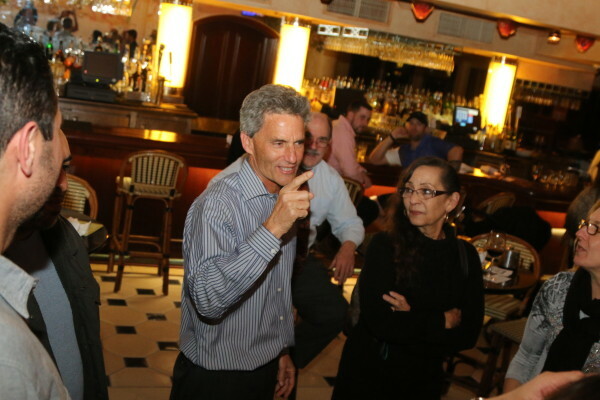 Pendergraft, Aspel and about 100 supporters of the measure held what was to have been a celebration party at HT Grill in Redondo’s Riviera Village and remained hopeful for most of the night as B clung to a narrow lead built by the early count of mail-in ballots. The measure won 10 out of the city’s 13 voting precincts via mail-ins, building a 2,996 to 2,546 lead. But as vote totals were tallied from ballot box votes, a trend quickly emerged: precinct after precinct rejected the measure. Finally, late in the evening, as votes from District 2 — where the power plant is located — were finally tallied, the lead switched and the room at HT Grill grew relatively silent. Pendergraft did not hide his shock. Pendergraft is an engineer who found himself in the odd position of first convincing his superiors to take AES into the real estate development realm and then at the helm of a political campaign. He said he became personally vested in Measure B’s success — he would drive to work each morning, and as he hit the crest of the hill on top of 190th Street, he envisioned a waterfront free of industrial use. He said that voters appeared to believe that the power plant would be gone with or without Measure B, as opponents argued, both in ballot arguments and on the street, door-to-door. Pendergraft said that the current power plant would indeed be gone, but now the most likely outcome is either a modernized plant or another industrial use, such as the battery storage project AES just launched in Long Beach. Opponents of Measure B argued that AES would not be recertified for a new power plant by the California Energy Commission. Pendergraft said the company may reapply to build a new plant — it had withdrawn its application — but that voters had taken “a real gamble” if they believed Measure B’s defeat would end in a more scaled back compromise. Measure B, Pendergraft said, was AES’s compromise. Aspel called the election “democracy at its finest” as the plan was vetted and rejected by voters, regardless of his own support for it. He praised AES’s efforts. The mayor also praised Pendergraft, who only a few years ago was considered a political enemy of the city. Aspel said he saw a certain logic in the vote. Politically, going forward, Aspel said that if AES reapplies with the CEC to build a new power plant, he would not favor the city again filing as an official “intervenor.” He said that Brand and B opponents guaranteed the removal of the power plant with or without the measure. City Treasure Steve Diels looked at Hermosa Beach’s defeat of oil drilling in its own Measure O and saw a possible compromise: drilling for oil at the AES site. This option was contemplated as an environmentally superior alternative to the E & B oil drilling proposal in Hermosa Beach in the Final Environmental Impact Report for that project. Diels said one overlooked aspect of Measure B was it’s potential impact on property values. Aspel said he was still committed to a future without an industrial waterfront. But he said achieving that outcome would now be more difficult. The tension was palpable early on at the Cheesecake Factory, where supporters of No on B and Candace Allen Nafissi, the only candidate in any race this year campaigning against Measure B, had set up their election night party. Brand was confident early on while watching the early return numbers — the close margins between the mail-in ballot returns, combined with early indications that precinct voting was leaning against Measure B, spurred him onward. Todd Lowenstein, the president of Redondo Residents for Responsible Revitalization, however, wasn’t as encouraged. Visibly nervous, he often paced around the room before retaking a position around the monitor set up to watch the city’s election night stream. But as the clock neared 11:30, the mood turned — it wasn’t long before the 30-plus in attendance began clapping, cheering and singing loudly enough to be heard outside the restaurant. “To see Measure B go down…I’m speechless,” Brand said to the tight crowd of supporters, many of whom campaigned and canvassed in opposition to Measure B. “It’s because of this team, right here, firing and executing. That’s what we have to do to get Candice in City Council!,” he said to further applause, championing his candidate in the upcoming District 3 runoff election. One of the differences in this election was the emergence of R4, a new citizens group that led the “ground game,” sending out canvassers every night who likely were a key to the on-the-ground precinct voting victory on election day. Loewenstein said the campaign was a “David versus Goliath” match up, and that part of the victory was attributable to the substance of the arguments that were made against Measure B. The most relieved person in the room seemed to be Light, who had been campaigning along with Brand to rid Redondo of the power plant for more than 14 years. He had been at home for much of the night, a bundle of nerves, he said, until the numbers started to turn, and Brand called him down to join the party. Despite AES’s assertions that Measure B’s defeat would force the company to return its focus to industrial uses of its property, Brand believes the demise of the power plant remains inevitable.